IRVINE, CA--(Marketwired - Oct 29, 2013) - California Pacific Homes announces the Model Grand Opening of Jade Court in the Villages of Irvine's® Cypress Village this Saturday, November 2nd. The professionally decorated model homes and sales office will open at 10 a.m., when homebuyers will have their first opportunity to tour Jade Court's innovative courtyard home designs that offer up to three bedrooms plus loft, fine architectural detailing and a superior caliber of included amenities. 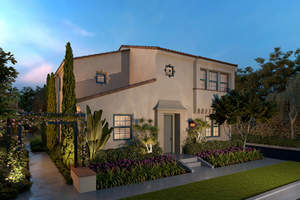 "The Model Grand Opening will offer visitors a personal look at Jade Court's four brand new floorplans and unique features that address the individual priorities of Irvine homebuyers. This exceptionally designed collection includes a first-floor bedroom with en-suite bath in Residences Two and Four and a versatile tech space in Residence Three," said Leslie Stillman, Senior Director, Sales & Marketing and Design Center for California Pacific Homes. "Homebuyers who desire functional, contemporary living spaces and a sought-after Irvine location in the vibrant new Cypress Village will find Jade Court a very appealing opportunity. During Jade Court's Grand Opening, guests are encouraged to speak with the sales team for important Phase One sales release information and how to begin the home buying process." Jade Court offers four uniquely different courtyard home designs that range from approximately 1,559 to 1,600 square feet, with 3 bedrooms, 2.5 to 3.5 baths, lofts in select plans and 2-car attached garages. Stunningly appointed kitchens feature Bosch appliances, plus generous center islands that open to living and dining rooms; energy efficient amenities are included in every residence. All homes feature a fenced yard or private deck for outdoor dining and entertainment. Prices are currently anticipated to start from the mid $600,000s. Cypress Village, within the Villages of Irvine®, offers residents everything families want and need to thrive now and in the years to come. Offering the next generation in new home designs, Cypress Village provides residents with resort-style recreation for the young and young at heart, a convenient setting near your favorite places and acres of parks for fun in the sun, and is conveniently located just moments away from the region's premier shopping, dining and entertainment. Students attend Jeffrey Trail Middle School, which opened in fall 2013, and the future Cypress Village Elementary School (scheduled to open fall 2014); both schools are conveniently located within the Village and are part of the heralded Irvine Unified School District. Created by Irvine Company Community Development, Cypress Village is located in the City of Irvine. The City of Irvine was recently ranked by Money Magazine as the "6th Best Place to Live in America." The highly-acclaimed master-planned community is renowned for allowing residents to enjoy a unique lifestyle unmatched in the region -- some of the best schools in the state; America's safest city for nine straight years; abundant open space, parks and recreational opportunities; and world-class dining, entertainment and employment. For more information about the Villages of Irvine, visit VillagesofIrvine.com. California Pacific Homes is a landmark homebuilder comprised of forward thinkers who possess the capacity and intuition to design and deliver inventive new neighborhoods in the most desirable locations. Driven by innovation and a fresh approach, the art and expertise of homebuilding is elevated to the next level by consistently introducing extraordinary new home opportunities to the Southern California marketplace. For more information, please visit www.calpacifichomes.com. To visit Jade Court during its Model Grand Opening, exit the I-5 Freeway at Jeffrey Road and turn right. Turn right on Roosevelt, right on Rush Lilly, right on Velvet Flower and right again on Scented Violet. The Jade Court models and sales office are open daily from 10 a.m. to 5 p.m. For more information, visit www.calpacifichomes.com and register your interest. Prices, product type and availability are subject to change without notice. This Saturday, Nov. 2nd, California Pacific Homes celebrates the Model Grand Opening of Jade Court in Irvine's Cypress Village.